If you saw my organized baking and spice cabinet post from last week (HERE), you know I spent the week on a mini kitchen decluttering spree. (Don’t give me too much credit, this is as far as I’ve gotten so far haha). 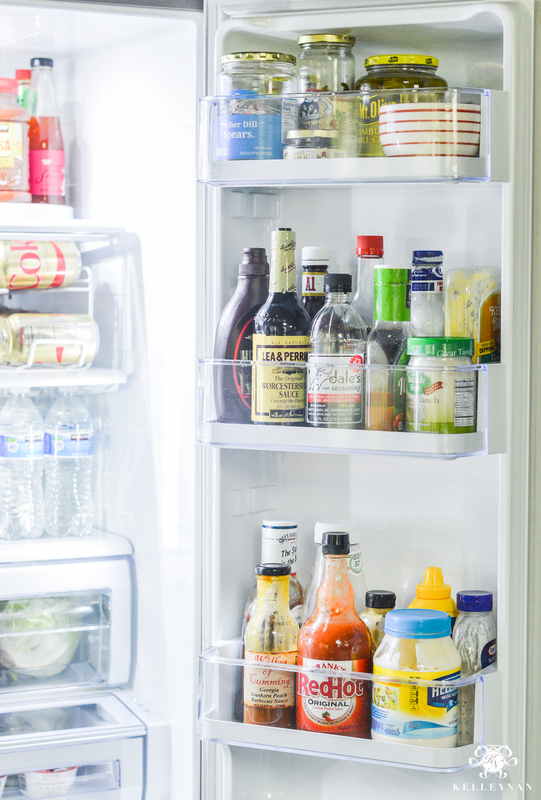 Tackling and organizing the refrigerator may have been even more satisfying than the spice cabinet, though. 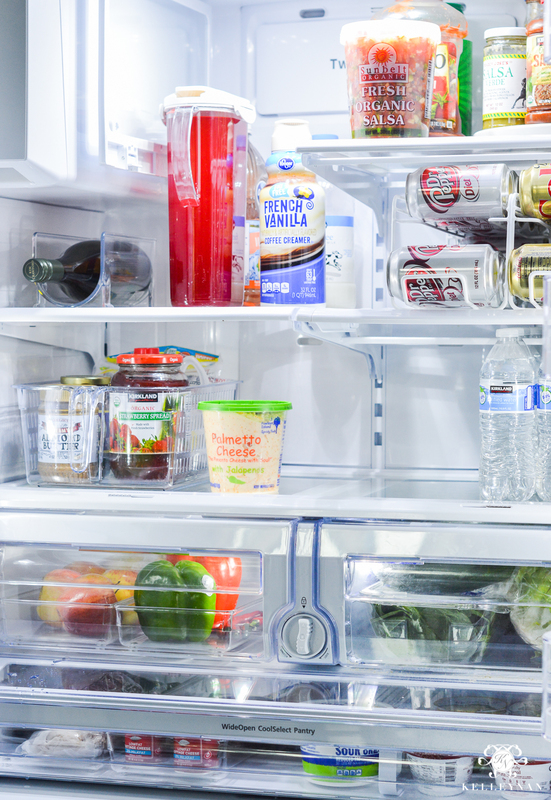 Over time, I’ve added a few organizational components inside, which has helped, but I had never actually deliberately organized and cleaned out the fridge in its entirety. To be honest, like the spice cabinet, it wasn’t horrible but it was far from “good”. Going into it, I thought about what made the most sense for us and how I could improve the functionality. 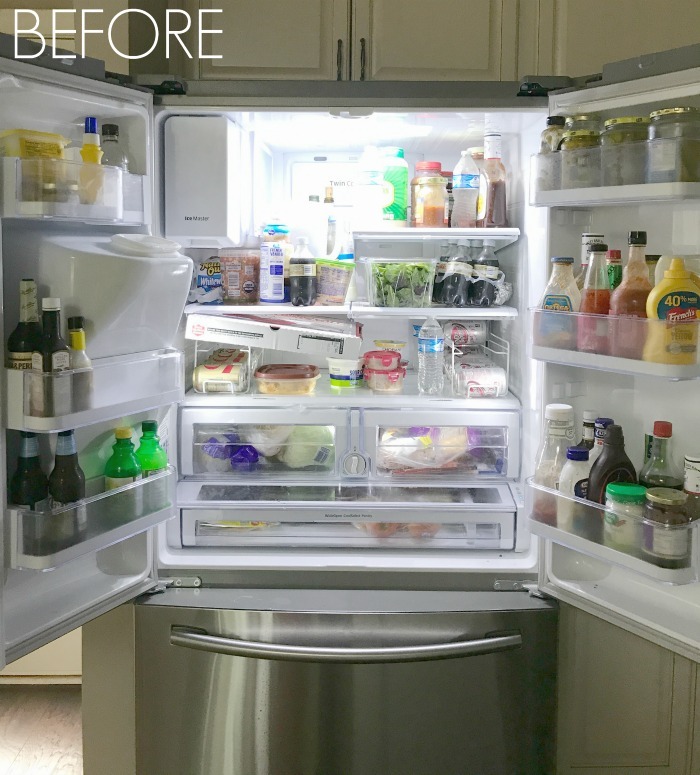 Below, I’m sharing my top 9 refrigerator organization solutions and an organized fridge as the result of these improvements. Not terrible and keep in mind, this is for a family of two. 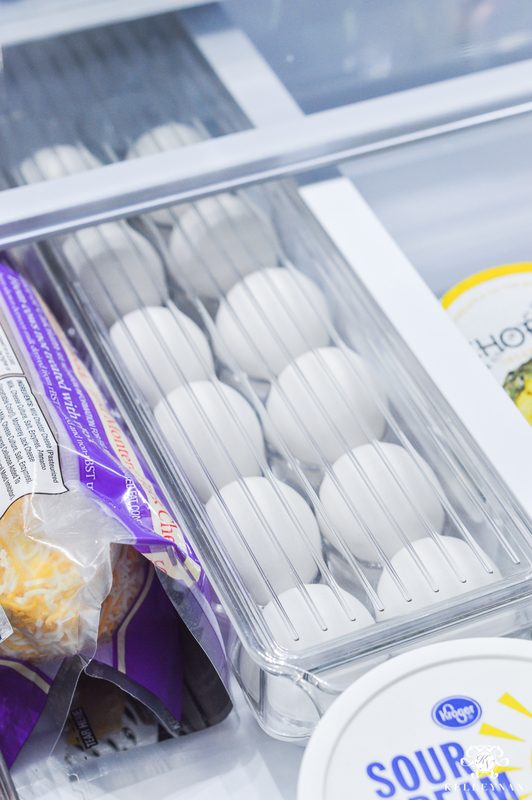 We try to stick to our weekly meal planning and as a result, have less filling the refrigerator but because we aren’t tight on space and nothing has a designated spot, we’ve gotten in the habit of just sticking things where there is room. (Hello, large pizza box!) We eat a lot of leftovers but this method has hindered our ability to stay on top of what we actually have. So, first, I took everything out and spread the goods all over the kitchen counters. I sorted by type to see what I had in abundance and then I cleaned the inside from top to bottom. If you have removable/adjustable shelves, this is the stage when you can evaluate what you have and the best shelf configuration for your family. I tossed items that were expired but to be honest, there wasn’t much that I had to throw away. Here is the “after”, with a similar amount of contents, just better organized and thoughtfully “zoned”. I kept a larger space open on the bottom shelf, dedicated to leftovers. These are the simple additions that helped me whip this baby into shape. 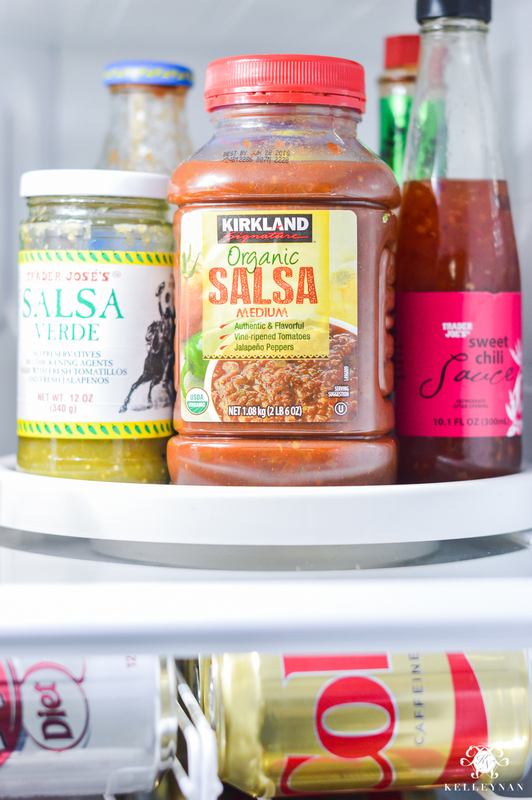 By the way, if you’ve never tried the Sunbelt Organic Salsa, you must; I picked mine up at Costco. I already had two beverage can dispensers (HERE) in use and loved them; but, reconfiguring them has freed up some space. 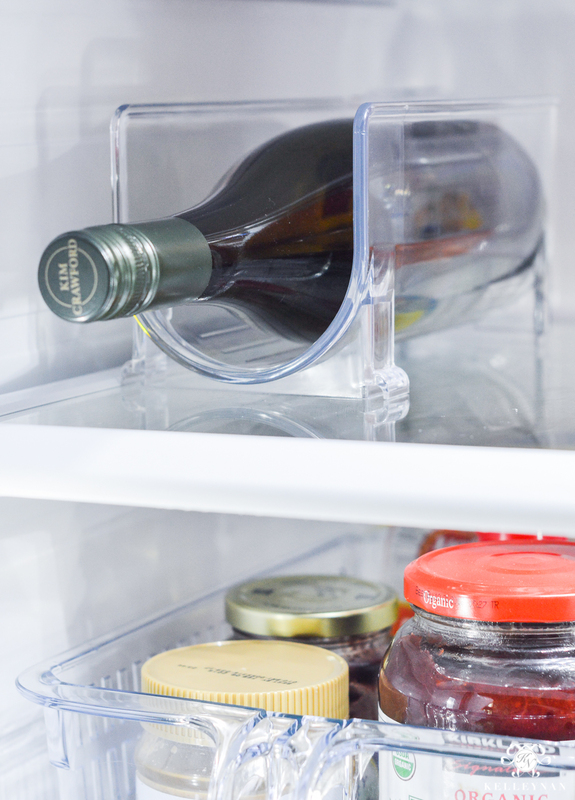 They are available in a plastic/acrylic also (HERE), but I prefer the wire as they aren’t difficult to keep clean, the beverages stay cold, and they are less expensive. 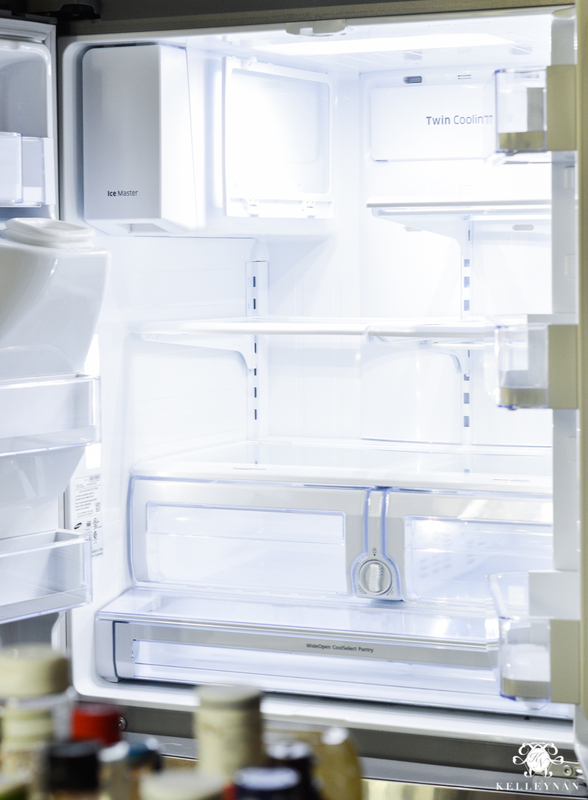 I have seen beautiful refrigerators, filled with storage bins, that are serious #oranizationgoals. But, I know that just won’t work for us. Similarly to the turntable though, I wanted a solution to corral the jellies and breakfast items. This heavy duty container works perfectly. And, I don’t feel like I’m playing Jenga, pulling everything out and putting it all back in. 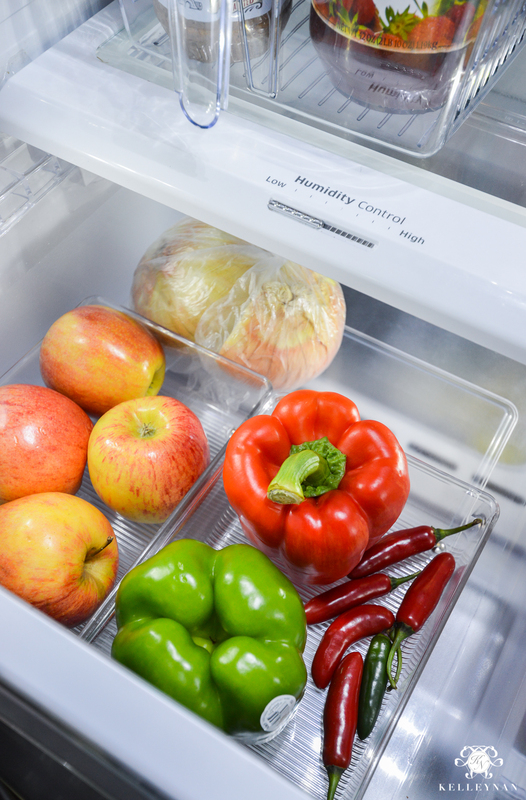 Produce drawers, humidity levels, and how your store your fruits and veggies is a hot point for a lot of people. (seriously, people are SUPER vocal about this haha) Some things emit gasses and will ruin other produce, some things should be kept out of the fridge altogether… and while I don’t stick to any rule too much, the general guideline is that if it wilts, it needs high humidity; if it rots, it needs low humidity. (This means that your fruits and veggies may mix together). Also, I’ve heard that in a lot of cases, plastic grocery store bags totally negate any humidity control so its best to store your produce out of the bags, when you can. I keep my onions in the bag, still, and unless we get a huge mess of apples, I usually keep those stored in the fridge too (although, I don’t believe you’re supposed to 😉 ). Before I organized, I basically had both controls set in the middle- I know I’m not alone! Adding plastic bins helps keep things sorted, especially if you aren’t using your plastic produce bags. And, because we plan our meals by the week (and I continually take visual inventory for side dish ideas if we have leftover produce), they typically don’t get over-filled. The bottom drawer used to basically be the space where we stuck something if we didn’t have room for it elsewhere. Bringing all the meat and dairy together has made things so much easier. 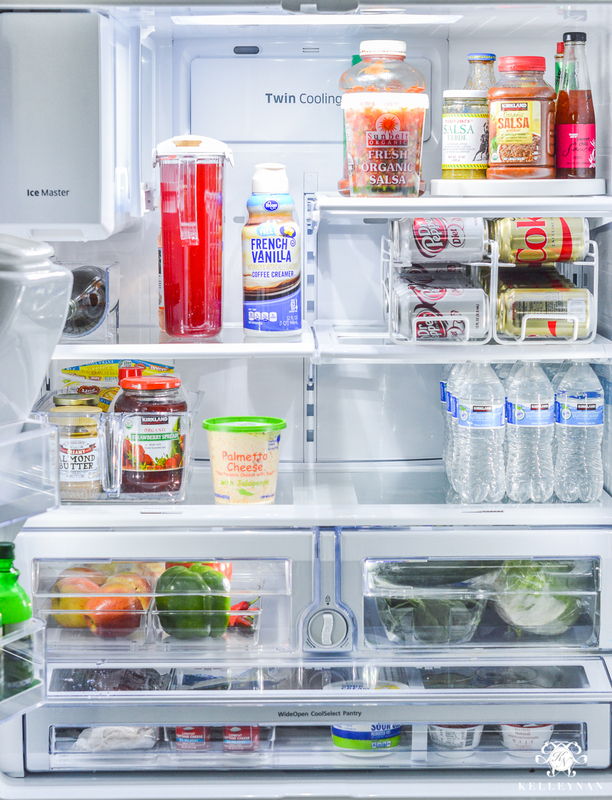 Believe it or not, half of these items used to take up prime real estate in the main portion of the fridge. 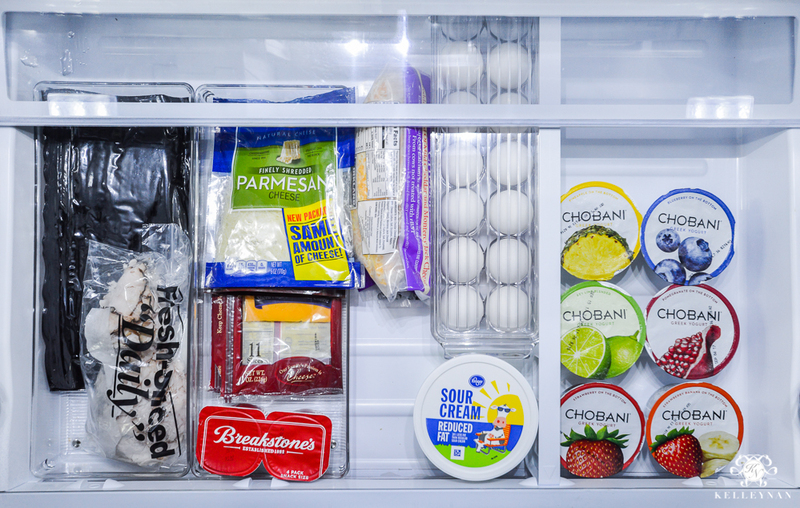 I also used some plastic bins to separate the meat and cheese and adjusted the inside divider to hold the yogurt. If the meat and dairy drawer became too filled, the first item I would relocate would be the eggs for the simple fact that having transferred them to this plastic storage crate, it is tough enough to stack some goods on top. The doors were improved immensely and again, I tried to keep everything separated into “zones”. Something I’ve had for a long time (after Mama Nan convinced me hers had changed her life) is plastic storage for open butter. This one is specifically intended for cream cheese, but can fit multiple sticks of butter perfectly. 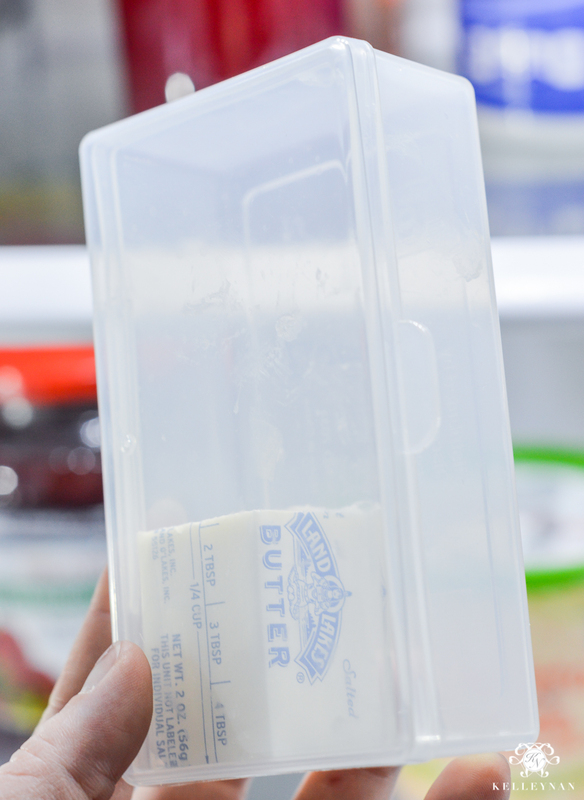 Also, I love that this simple style can be housed in the door’s butter area with limited space. Here’s a look at the opposite door. I separated based on height and type, resulting in primarily storing pickle items on top; dressings/steak sauces in the middle, and condiments on the bottom. There are a few exceptions with some height/space restrictions but for the most part, each collective is pretty well established. On the top of the door, I keep fast food packets stored in a small bowl. We don’t accumulate a ton as we don’t eat fast food often and I don’t typically keep common condiments like ketchup. I used to keep these in a kitchen junk drawer which ALWAYS inevitably ended in a huge mess. 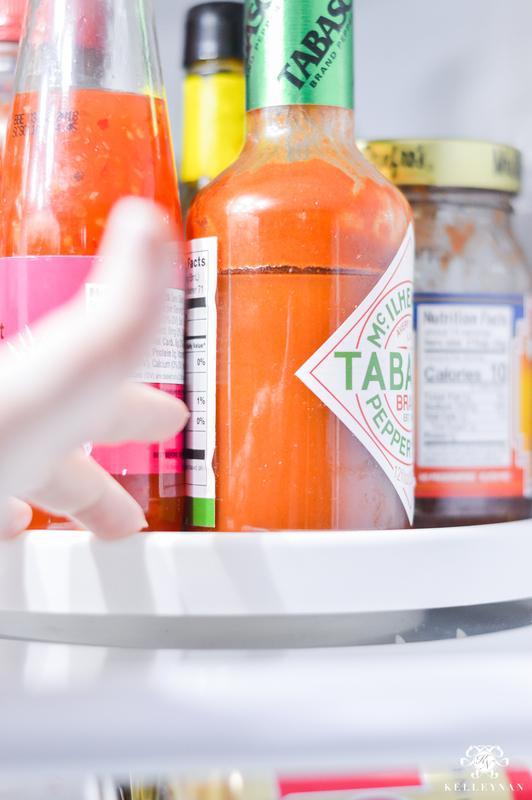 If you accumulate more sauces, you can use a full sized bowl in the main fridge section or in one of your drawers. 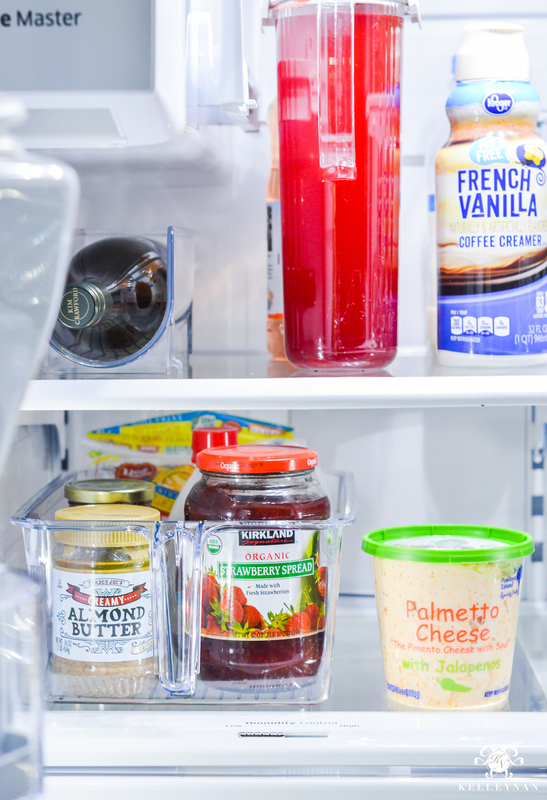 I’ll admit, I can’t stop opening our fridge doors just to admire how organized everything is (raise your hand if you’re the same way! ); plus, one week in and everything still has its spot. Here’s a recap of some of the favorite easy organization solutions I used (many are currently on sale right now 😉 ). To see more organization posts, visit my organization gallery HERE. 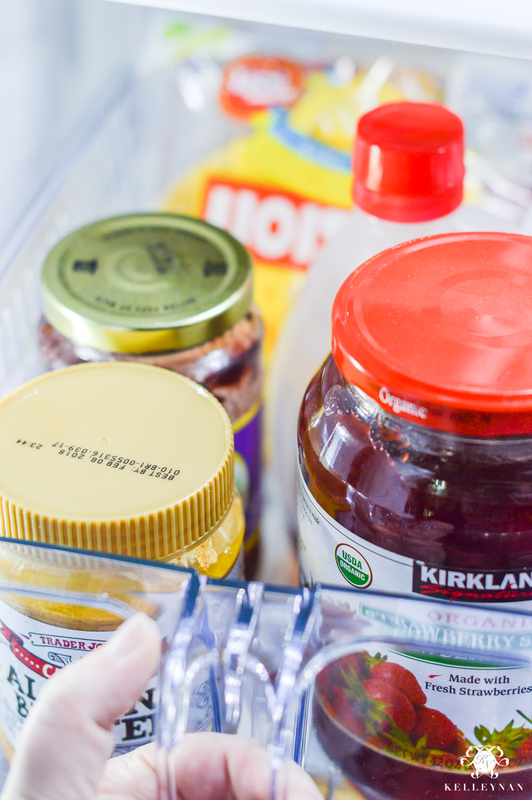 Next up- the beast that is my pantry… Stay tuned because that dark hole is in DESPERATE need of some TLC. You can sign up for emails below to make sure you never miss a single detail. Looks great Kelley. I too have our frig set in zones. Makes things so much easier. I can see what we have or need at a glance. I keep a plastic bin to store our meats for week on a shelf to prevent contamination. It’s worked great. I need to invest in some bins for my veggie and fruit drawers to keep things separated. Tall pitchers and wine bottles are hard to fit if we have our extra shelf in and extended fully. I too purchased a slim pitcher that seems to help. Once again you have given me some great ideas to be better organized ! Thanks Kelley Nan- sure do love your suggestions!! Hugs! This is absolutely fabulous. My fridge is a mess. 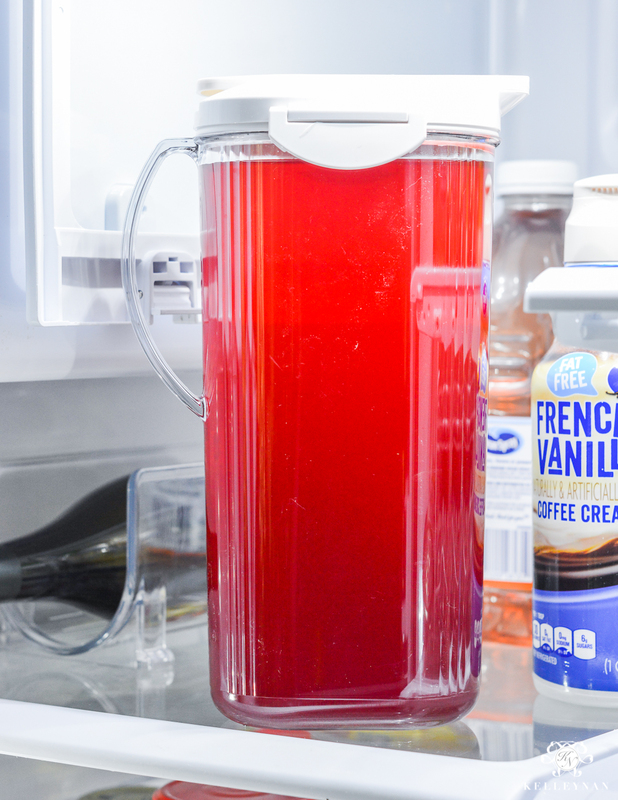 No matter how much I clean it, my hubby seems to say, “wow it’s clean in there, I got to make it messy and make spills, not clean them up.” I will be doing most of this to our fridge tomorrow . Ivory, I totally get it. Good luck today; if it helps, we are over a week in and it has been so easy to stick to! Kelly, that looks awesome!!! 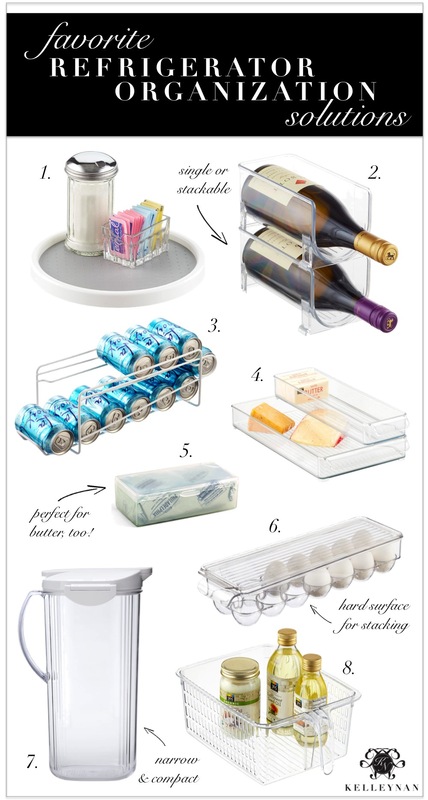 Great finds for organizing a frig! Can’t wait for the pantry post! Piper, thank you! I’M excited too but am nervous about the initial “evaluation” haha! I am so inspired! I am making a list and going to do some shopping for my fridge. It is always a mess, but hopefully for not too much longer! 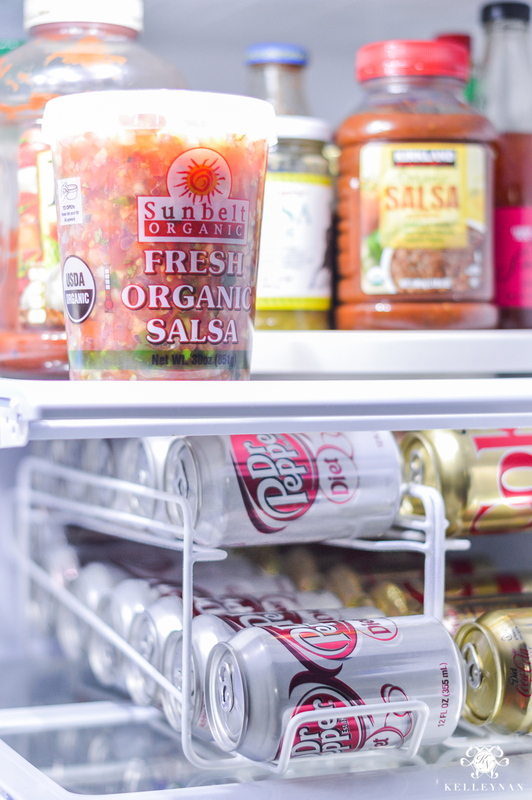 Kelly, I love how you have organized your refrigerator! 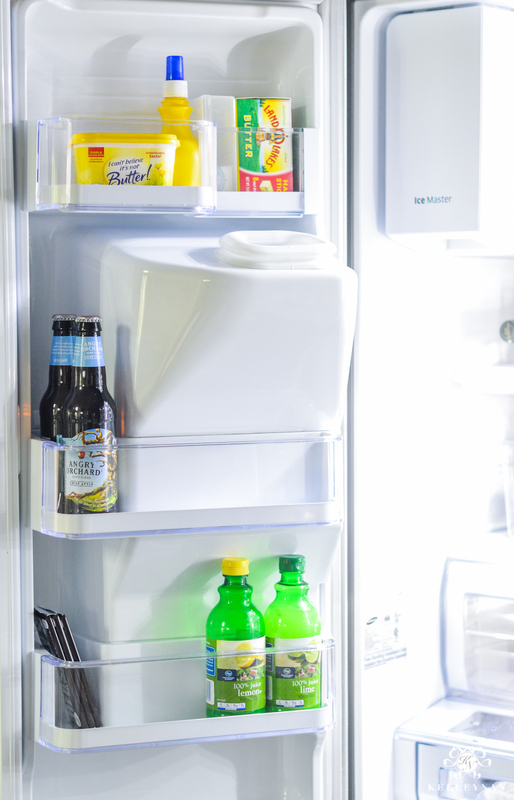 We have this exact refrigerator and I’m going to incorporate some of these ideas into ours.